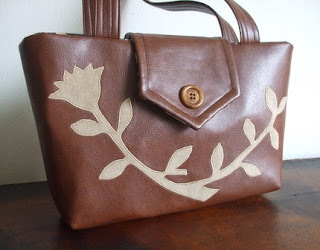 Today my Wayfarer Purse with a Flower Applique, shown above, sold from my Etsy shop. The purse is made from a faux leather I purchased at a lovely home decor fabric shop in South Carolina during my recent road trip/vacation. There was a big lounge chair on display that was upholstered with this fabric and it looked fantastic. I was so impressed I had to buy a few yards. They rolled the fabric on this really long tube and it almost didn't fit in the car. I'll tell you, this fabric did quite a lot of traveling before it reached its destination in NYC! Also, today I decided to send a gift to a very special person. So my latest creation, The Classic Shoulder Bag with a Horse Applique, will be traveling to its destination tomorrow. I hope she loves it! I'll have more horse inspired creations in the Pesky Cat Designs shop very soon. This Faux leather is fantastic; looks so soft! Can't wait to see more of your horse inspired designs, too!